Peasant-style dresses are such a fabulous design for children. They are the perfect combination of sweet, feminine and practical, without being too prissy and formal. Girls can still climb trees and play in the park without being hindered by bulky or overly fussy clothing. The elastic neckline makes it super easy for younger children to learn to self-dress. Organic cotton is naturally soft, breathable and gentle on children's skin. This versatile style is perfect for everyday wear or for a special outing. This dress is made from light-weight, naturally soft and breathable 100% organic cotton designer fabric. 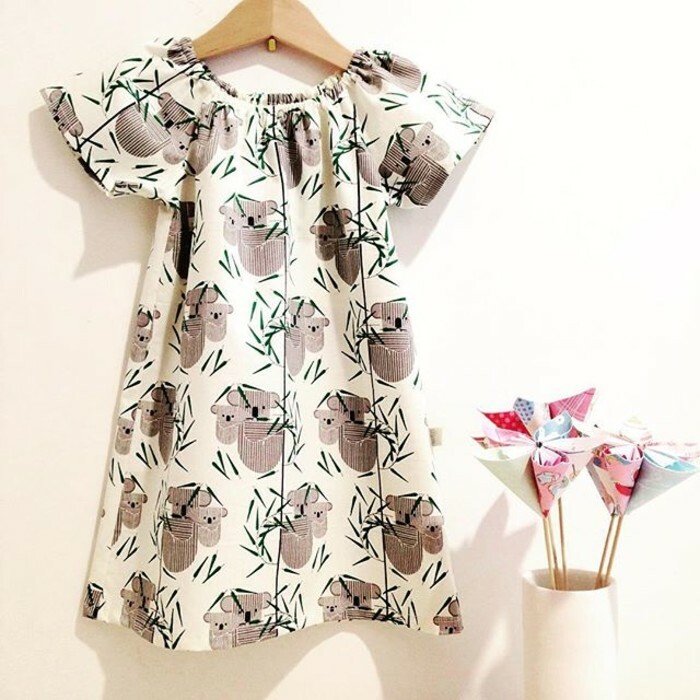 This fabric features a super cute pattern of mum and bubba koalas in grey with green leaves on a creamy-white background. I make my garments to last and professionally machine finish all seams for a long lasting, durable garment. All Wombat & Poss items arrive at your door packaged neatly and beautifully wrapped - ready for giving or keeping. If your purchase is for a gift, I’d be glad to send it directly to the recipient and I can include a gift card at no extra cost. My items are sized according to typical Australian and New Zealand sizes.